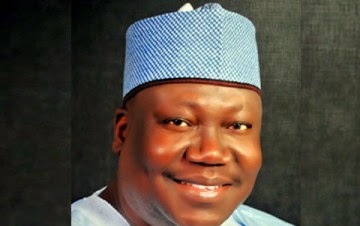 Twelve out of the 13 senators elected on the platform of the All Progressives Congress from the North East, said in Abuja on Friday that they were not in support of Senator Ahmad Lawan’s emergence as the consensus candidate of the geo-political zone for the post of Senate President, in the incoming Eighth National Assembly. The lawmakers, led by Senator Danjuma Goje ( Gombe Central) at a news conference, said they were still pleading with the leadership of the party to zone the position to their region but that they had not picked anyone as the consensus candidate. They also vowed to resist any attempt by anyone or group of people, to impose a candidate on them. The Senators said they would decide on the consensus candidate on their own instead of queuing behind a candidate anointed by outsiders. Goje, who spoke on behalf of his colleagues, explained that Senators from the North-East held a caucus meeting on Thursday night at the Kaduna room, Transcorp Hilton Hotel, Abuja with Lawan himself in attendance. He said the meeting resolved that the caucus should be allowed to consult with the party leadership to nominate their preferred candidate for the position. Goje alleged that Lawan sneaked out of the meeting while they were still agreeing on the resolutions, only for him to be announced few minutes after, as the candidate endorsed from the North-East for the post of Senate President by both the North-West and South-West senate caucuses. Goje insisted that 12 out of the 13 APC senators- elect from the North East, had resolved to establish the zone’s caucus for the 8th Senate. He appealed to the APC highest hierarchy to zone the highest position in the National Assembly, that is, the position of Senate President to the zone in view of its peculiar circumstances. ‘’We don’t know anything about the endorsement of anybody from the North-East being reported on the pages of newspapers.